However, the toxicology documents used by the FDA to approve the toothpaste were only released early this year after a Freedom of Information Act lawsuit last year – and reveal the agency relied upon company-backed science to reach its conclusion, Bloomberg News reported. However, evidence available at the time, as well as newer studies, show there are indeed concerns with the chemical – including premature births and underdeveloped bones in animals. “The recently released pages, taken alongside new research on triclosan, raise questions about whether the agency did appropriate due diligence in approving Total 17 years ago,” scientists told Bloomberg. Furthermore, a study from 2003 found triclosan in the urine of 75 per cent of 2,517 Americans – including children – who were tested by the Centers for Disease Control and Prevention. Despite evidence – including pages in the report showing how tests found fetal bone malformations in mice and rats – Colgate deemed the results irrelevant because they were conducted on animals. “We have created a system where we are testing these chemicals out on the human population,” scientist Thomas Zoeller told Bloomberg. “I love the idea they are all safe. But when we have studies on animals that suggest otherwise, I think we’re taking a huge risk,” he added. 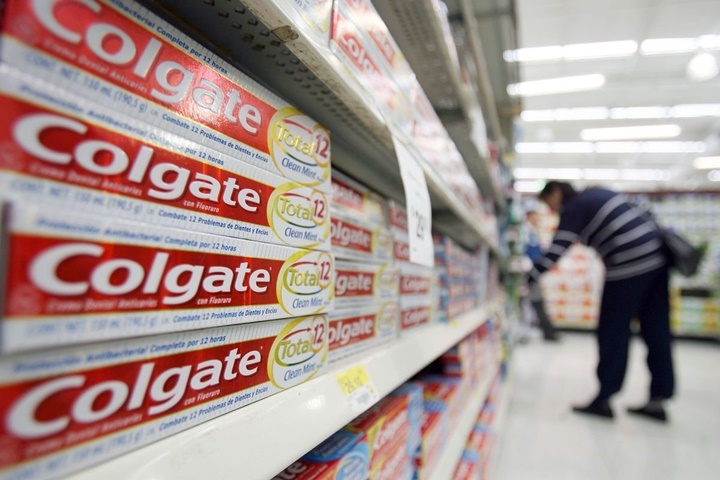 “In the nearly 18 years that Colgate Total has been on the market in the U.S., there has been no signal of a safety issue from adverse-event reports,” spokesman Thomas DiPiazza told Bloomberg. The FDA said on its website that triclosan is “not known” to be dangerous to humans – but the results found in animals has given them enough of a reason to run tests again. In a sign of the concern over the chemical, Minnesota lawmakers banned the chemical in May. Avon and Johnson & Johnson have also announced plans to cut the chemical from its products.